Clink here to see the entire story featured on CBS National News. Steve Gratz has been named Interim Director, Office of CTE, following the promotion of Kathy Shibley to Senior Executive Director, Center for Student Support & Education Options. The Ohio Department of Education is being restructured with the goal to “achieve better results in meeting the needs of Ohio’s students with greater efficiency and effectiveness.” The structure involves two main divisions: 1) Learning; and 2) Accountability and Quality Schools. Under the proposal, the Office of Career-Technical Education (CTE) falls within the Center for Student Support and Education Options of the Division for Accountability and Quality Schools. This shift is not expected to change the products and services of the Office of CTE. At the request of the Ohio Association of Career-Technical Superintendents and Ohio Association for Career and Technical Education, the Ohio General Assembly added a provision to HB 153 (State Budget) allowing school districts to charge fees to “free lunch” students for certain items used in career-tech programs. These students had been given a blanket exemption from student fees under legislation enacted in 2009. This new provision clearly allows districts to charge “free lunch” students with certain fees in career-tech settingsundefined something which was not previously possible. However, the exact scope of this language is open to interpretation. In a carpentry class, for example, does this language allow charges for all wood used by a student, or only for the wood that is “retained” by the student afterward as a piece of furniture or leftover wood? Both interpretations are possible under the language used by the General Assembly. Ohioschool fees statute, the Ohio Supreme Court has said that “Free public education is the rule in this state, fees the exception.” Assn. for Defense of Washington Local SchoolDist. v. Kiger, 42 Ohio St.3d 116 (1989). Although no one can predict how the new amendment of school fees will ultimately be interpreted, this case would suggest that the courts may feel compelled to a give a narrower, rather than a broader, interpretation. OhioAssociation for Career and Technical Education and Bricker & Eckler LLP. It is not intended to serve as a legal opinion with respect to any specific person or factual situation. On Sept. 13, as part of his nationwide tour to promote his jobs bill, President Barack Obama visited a classroom at Columbus’ newly renovated Fort Hayes Career Center. He spent significant time with the students and with instructor Keith Morefield in the graphic communications lab. Read more about President Obama's visit to Ft. Hayes. <?xml:namespace prefix = st1 /> Ohio, was one of the most policy-heavy state budgets in recent memory. It changed funding levels for public programs, but also shifted funding sources and modified administrative regulations for many state agencies and political subdivisions. While many districts suffered cuts both in Foundation Funding and reductions due to accelerated phase-outs of the tangible personal property (TPPT) and kilowatt hour (KWH) taxes, Career Tech received flat Foundation Funding at 2011 levels. The accelerated cuts in TPPT taxes will have a negative impact on CTE, but in a Statehouse compromise, the legislature capped cuts due to TPPT rollback at 4% of total resources to a district. A chart of funding for all JVSDs and a review of the impact on the TPPT and KWH taxes can be found at http://obm.ohio.gov/SectionPages/Budget/FY1213/SchoolFunding.aspx. School Supplies: Language contained in HB 1 last year eliminated all local discretion to determine how to cover costs for workforce-readiness equipment for students eligible for free lunch. This unfunded mandate disproportionately impacts CTE, where students often pay fees for tools, equipment, and licensure for their training and for later use in their professional careers. Language in the budget bill now gives school districts the option to charge students for supplies that are used for career readiness and are taken into the workforce following graduation. Tax Increment Financing (TIF): The Ohio Revised Code affords traditional school districts protection from reduced tax revenue when a locality utilizes tax increment financing. JVSDs will now enjoy the same protection negotiated by the traditional school district in the same TIF geographic area. School Facility funding for JVSDs: Currently, the OSFC, “may set aside up to two per cent of the aggregate amount appropriated to it for classroom facilities assistance projects.” New budget language would allow the OSFC to exceed the current cap if necessary to fund up to one new JVSD project per year. Degree Requirements: Current Ohio Administrative Code section 3301-24.08 requires that career-tech teachers who do not already have a baccalaureate degree complete at least an associate degree in their field before they can renew a provisional teaching license. Now, the State Board of Education can take life experience, professional certification and practical ability into account when issuing a career technical teaching license. Applicants will not necessarily need to hold a degree to renew their license. Background Checks: Current law requires a background check for every new teacher – this includes instructors who have taught in the past but may have been on hiatus for a period of time. But in the adult context, instructors often are hired to train adults in short, skill-upgrading courses that do not last the entire school year. The new law will allow JVSDs to perform background checks every two years for adult education instructors, lessening the burden on CTE schools with adult ed instructors who teach on irregular schedules. Sick Leave: The Ohio Revised Code creates an unfunded mandate that all full-time and part-time, seasonal, intermittent, hourly and per diem board of education employees shall receive 15 days of paid sick leave per year, credited at a rate of 1 1/4 days per month. This applies to part-time adult education instructors even though such employees set their own schedule and re-schedule a class when sick. The budget bill exempts part-time adult workforce education instructors from the current leave requirement, more accurately reflecting the nature of their schedules. Inclusive Finance Option: Given their large geographic areas and tax valuations, career centers often finance improvements via voted levies rather than voted bond issues like their member districts might pursue. Career centers who also train adults can now pursue a single levy, so all components relating to an OSFC project, Local Share and Locally Funded Initiatives, may be financed. In addition to the items listed above, the Kasich Administration worked with State Senators and Representatives to ensure that a school district’s total operating funding be reduced proportionately if the district is unable to spend the total amount of career-technical education funding allocated to that district. This is to discourage districts from not spending CTE dollars to help bolster the general operating fund for that district. ACTE pursued other items in the budget that were not included because of ongoing discussions surrounding the potential ballot referendum on Senate Bill 5. We will keep working throughout the remainder of this year to track and influence important legislation and proposed rules affecting career and technical education throughout the state. We understand that Governor Kasich desires to revisit the state budget and education reform when legislators return from summer recess in September. As of this report, no formal meetings have been set, but certain individuals have been identified as the lead legislators and administratos to discuss school funding in the coming year. State Senator Peggy Lehner (R-Kettering) and Dr. Robert Sommers will be driving that effort. The free protective eyewear program was renewed for the 2011/2012 school year. Ohio ACTE was pleased to partner with the Ohio Ophthalmological Society again this year to promote the importance of vocational eye safety in the upcoming school year. Through a generous grant from the Ohio Department of Health's Save Our Sight Fund, we are able to provide qualifying Ohio schools and their technical education programs FREE protective eyewear. The overall purpose of this program is to promote eye safety and to encourage students to use protective eyewear outside of the classroom. This is the third year of the voactional eyewear program. This year, participation surpassed the number of schools which had registered in the past. We received applications from 29 schools who requested over 9,500 pieces of protective eyewear. Schools which are selected to participate will be receiving their eyewear in early October. The Speaker of the Ohio House William G. Batchelder recently appointed State Representative Tim Derickson (R-Oxford) to serve as chairman of the Workforce Development Study Committee, a bipartisan committee that will solicit feedback from Ohioans to make Ohio a national leader in developing a well-trained and educated workforce. The Committee held the first of several meetings Aug. 31 in Columbus. 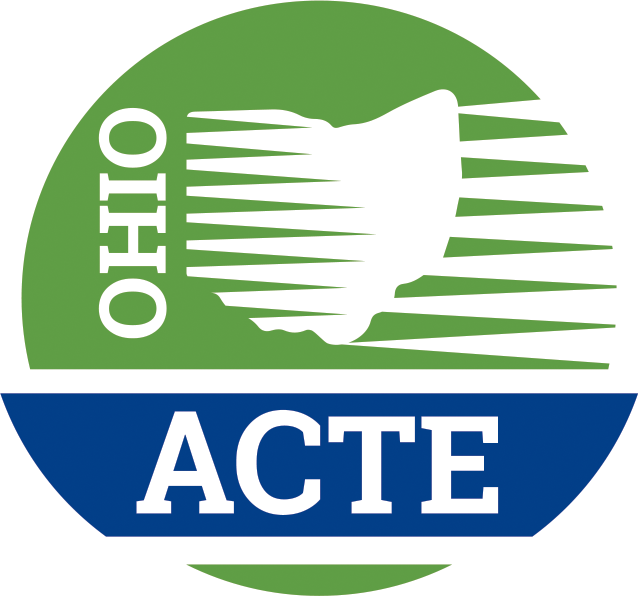 Ohio ACTE members Kim McKinley, Director, Tri-County Adult Career Center, and president of the Ohio ACTE PACE Division and Nancy Luce, Upper Valley Career Center Superintendent, provided testimony on behalf of Ohio ACTE and CTAE. The Committee is scheduled to meet several more times at various locations throughout Ohio. Click here for more information and details regarding the meetings. Kathy Shibley will lead the new Center for Student Support and Education Options, part of the Ohio Department of Education restructure with the goal to “achieve better results in meeting the needs of Ohio’s students with greater efficiency and effectiveness.” The proposed structure involves two main divisions: 1) Learning; and 2) Accountability and Quality Schools. Under the proposal, the Office of Career-Technical Education (CTE) falls within the Center for Student Support and Education Options of the Division for Accountability and Quality Schools. This shift is not expected to change the products and services of the Office of CTE. "This new position is an indication of the level of respect in ODE for CTE and what it brings to the quality of school options for students and it will put CTE in discussions that cross all aspects of ODE’s products and services. I truly believe it will be good for CTE. And, I know that our work was well designed based on our Perkins Plan under the old structure and will remain the driving force under our new structure. I hope you won’t consider me “gone,” but rather as having a wider perspective that I can bring to the work in CTE. I remain fully committed to our Perkins vision and all things CTE," Kathy Shibley said in her recent column in the August 2011 CTE Update. A new Director for the Office of CTE has not yet been named. ACTE is proud to offer you an opportunity to develop the leadership skills of existing and potential leaders in your Region. The Leadership Development Task Force has developed a new leadership training program to further develop current state and regional association leaders, while also exposing up and coming leaders to leadership development. If you would like to be considered one of Ohio's two candidates, please email Christine Gardner, Ohio ACTE Executive Director at christine@ohioacte.org. On June 6, the Columbus Dispatch ran an editorial in support of "vocational" education and how it has grown and evolved.